This may sound a little dramatic….unless you lived our life before rye. Rye is the cover crop we use in our pumpkin patch. The seed is flown over the field and dropped in each fall. It grows up in the spring, Dave makes rows through the rye, we kill it off, plant pumpkins in the rows, then roll the rye flat. 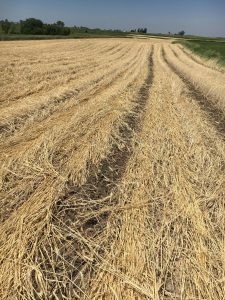 The flattened rye makes a barrier or cover (thus the name cover crop) between the rows of pumpkins and helps keep weeds down. Life before rye meant that we fought water hemp all year. Water hemp is huge. It is tough. It is prolific. It can take more than one person to pull it out of the ground. Life before rye was…hard, sweaty, exhausting. Our little family of four is very thankful for rye! Here is the rye after it’s been rolled. This is what the field looked like at the end of last week.